The Restoration Project Wrap-Up and Thank You Gift! Welcome to Day #31 of the Restoration Project! 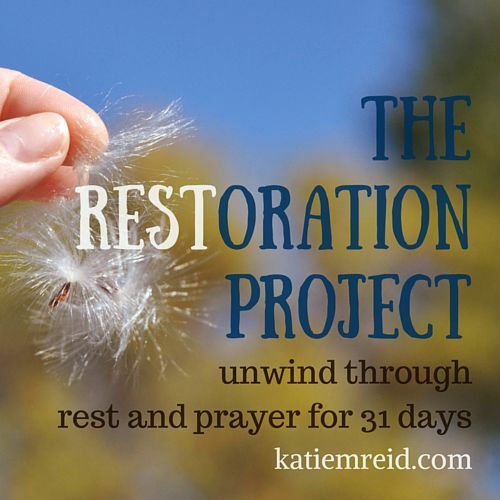 We made it to the last day of this journey of unwinding through rest and prayer for 31 days. Thank you for taking this journey with me. Whether you walked the whole way, caught part of the series, or just one post, I appreciate that YOU were here! When one of my series ends, I feel conflicted. On one hand, I am glad and relieved it’s done, on the other hand, I feel sentimental and a little emotional that it’s coming to an end. It’s been a joy to be here with you everyday this month. Starting in November, I will be back to my regular writing schedule here on Tuesdays and Thursdays and Periscoping on Monday and Friday at 1:30 EST and Wednesdays at 7:00pm EST. 1. Spiritual rest is directly related to our trust level with God. When we trust Him we can rest on the inside, even if there is chaos and problems swirling around us. 2. 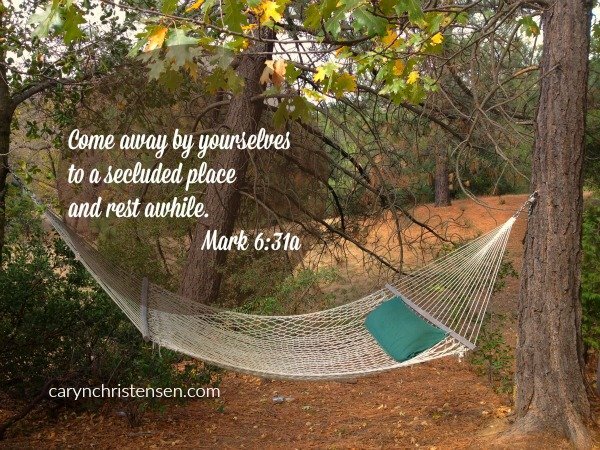 God modeled a day of rest for us, on purpose. We would be wise to follow His lead and trust the undone things to His keeping. 3. Resting might be more about preparation than it is about recuperation. 4. Getting rid of clutter and throwing away stress can help us rest better. 5. Jesus is our Ultimate Restorer and able to redeem the broken places within us. 1. There is beauty in praying as a community and in unity. 2. 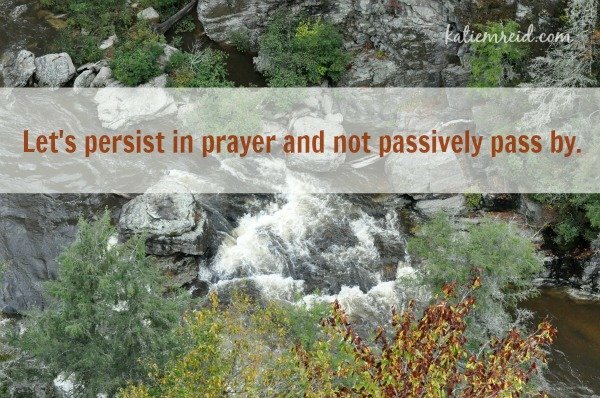 Sometimes God answers our prayers in unexpected, surprising ways. 3. 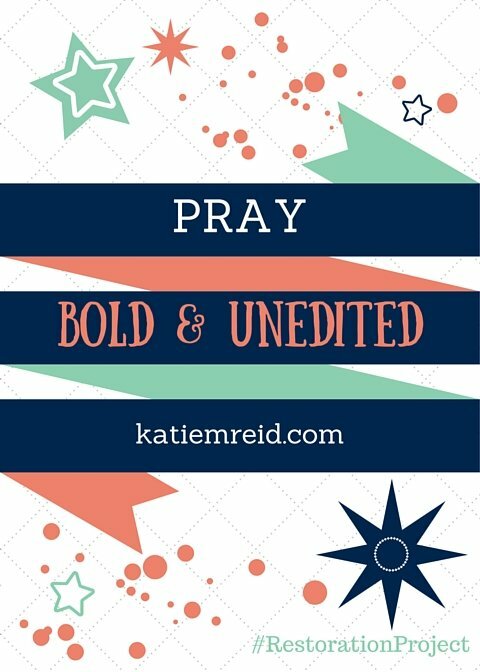 Pray unedited—God wants you to be real with Him. 4. When we unplug we create breathing room to connect with God. 5. Pray bold prayers and believe that He will answer you. What did you learn through the Restoration Project? I would love to hear what God did in, through and around you this month. 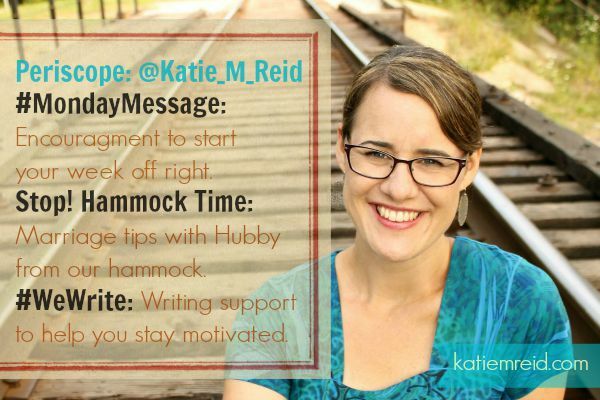 Send me an email (via the contact form) and let’s connect. A Thank You Gift for YOU! I made a free printable for my email subscribers that showcases a key lesson we learned through the #RestorationProject series. I will send it out in about a week, so if you aren’t a subscriber yet you still have time to sign-up and receive the printable. You can do so be entering your email address at the top of this page. I’d be honored for you to join the community as we find grace in the unraveling of life, together. I’m also over at God-sized Dreams today discussing that Detours Aren’t Dead-End Dreams. Day #31: Restoration Project Wrap Up and Thank You Gift! P.S. If you are looking for another series to read, check out 31 Days with My Brother, The Psalms Series, 31 Days of Isaiah 40, Unraveling Grace, or Intentional Mothering. Thanks for reminding me the importance of Sabbath in my lif. We made it! Now let’s rest! Thank you Meg. Let’s learn together.